The tutorial will teach you how to remove blank spaces in Excel to give your worksheets a clear and professional look. Empty cells are not bad if you are intentionally leaving them in right places for aesthetic reasons. But blank cells in wrong places are certainly undesirable. 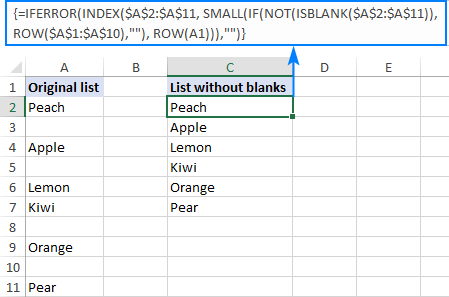 Luckily, there is a relatively easy way to remove blanks in Excel, and in a moment you will know all the details of this technique. 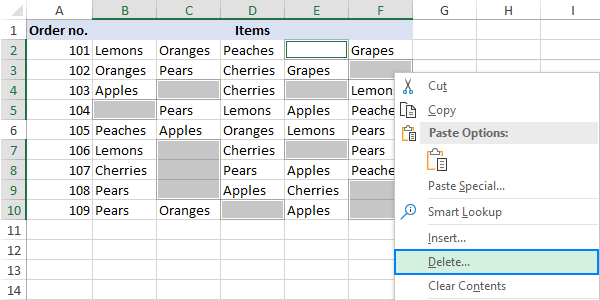 Deleting empty cells in Excel is easy. However, this method is not applicable in all situations. To keep yourself on the safe side, please be sure to make a backup copy of your worksheet and read these caveats before you do anything else. Select the range where you want to remove blanks. To select all the data on the sheet, click the upper-left cell and press Ctrl + Shift + End. This will extend the selection to the last used cell. 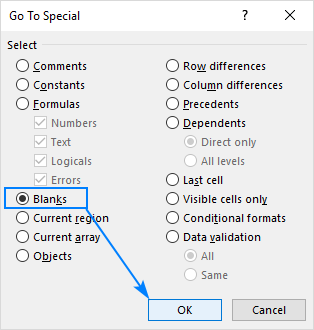 In the Go To Special dialog box, select Blanks and click OK. This will select all the blank cells in the range. Tip. If something has gone awry, don't panic and immediately press Ctrl + Z to get your data back. If your data is organized in a table where columns and rows contain related information, deleting empty cells will mess up the data. In this case, you should only remove blank rows and blank columns. The linked tutorials explain how to do this quickly and safely. It is not possible to delete any individual cells in an Excel table (vs. a range), you are only allowed to remove entire table rows. Or you can convert table to range first, and then remove blank cells. 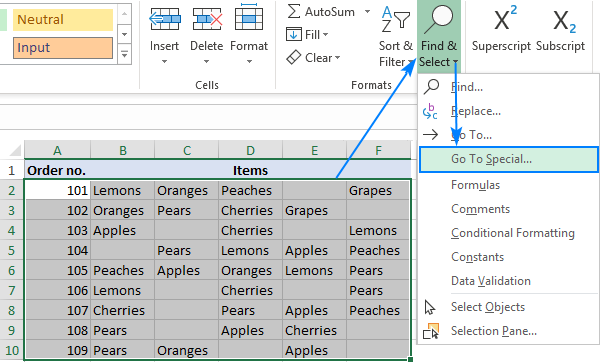 Excel formulas can adjust to many changes made to the referenced data. Many, but not all. In some situations, the formulas that referred to the deleted cells may get broken. So, after removing blank spaces, take a quick look at the related formulas and/or named ranges to make sure they work normally. If you fear that removing blank cells in a column may mangle your data, leave the original column as-is and extract non-empty cells to somewhere else. This method comes in handy, when you are creating a custom list or drop-down data validation list and wish to ensure there are no blanks in it. With the source list in A2:A11, enter the below array formula in C2, press Ctrl + Shift + Enter to complete it correctly, and then copy the formula down to a few more cells. 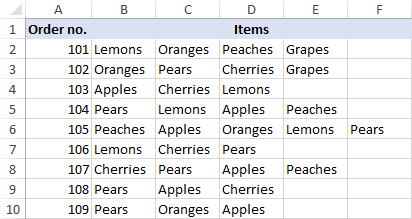 The number of cells where you copy the formula should be equal to or greater than the number of items in your list. Tricky at first sight, upon a closer look the formula's logic is easy to follow. In plain English, the formula in C2 reads as follows: return the first value in the range A2:A11 if that cell is not blank. In case of an error, return an empty string (""). Return the 2nd non-blank value in C3, the 3rd non-blank value in C4, and so on. NOT(ISBLANK($A$2:$A$11)) identifies which cells in the target range are not blank and returns TRUE for them, otherwise FALSE. The resulting array of TRUE and FALSE goes to the logical test of the IF function. ROW($A$1:$A$10) is only needed to return an array of numbers 1 through 10 (because there are 10 cells in our range) from which IF can pick a number for TRUE values. As you see, the array argument contains only the numbers of non-empty cells (mind you, these are relative positions of the elements in the array, i.e. A2 is element 1, A3 is element 2, and so on). In the k argument, we put ROW(A1) which instructs the SMALL function to return the 1's smallest number. Due to the use of relative cell reference the row number goes up in increments of 1 as you copy the formula down. So, in C3, k will change to ROW(A2) and the formula will return the number of the 2nd non-blank cell, and so on. However, we do not actually need the non-empty cell numbers, we need their values. So, we move forward and nest the SMALL function into the row_num argument of INDEX forcing it to return a value from the corresponding row in the range. As a finishing touch, we enclose the whole construction in the IFERROR function to replace errors with empty strings. Errors are inevitable because you cannot know how many non-blank cells are in the target range, therefore you copy the formula to a bigger number of cells. Blank cells that contain formatting or non-printable characters may cause a lot of issues in Excel. For example, you may end up having a much bigger file size larger than necessary or have a few blank pages printed. To avoid these issues, we will delete (or clear) empty rows and columns that contain formatting, spaces or unknown invisible characters. To move to the last cell on the sheet that contains either data or formatting, click on any cell and press Ctrl + End. If the above shortcut has selected the last cell with your data, it means the remaining rows and columns are really blank and no further manipulations are needed. But if it has taken you to a visually empty cell, know that Excel does not consider that cell blank. It could be a mere space character produced by an accidental key stroke, a custom number format set for that cell, or a non-printable character imported from an external database. Whichever the reason, that cell is not empty. Click the heading of the first blank column to the right of your data and press Ctrl + Shift + End. This will select a range of cells between your data and the last used cell on the sheet. Click the heading of the first blank row below your data and press Ctrl + Shift + End. Click Clear > Clear All on the Home tab or right-click the selection and choose Delete… > Entire row. Check the used range to make sure it now contains only cells with data and no blanks. If the Ctrl + End shortcut selects a blank cell again, save the workbook and close it. When you open the worksheet again, the last used cell should be the last cell with data. Tip. Given that Microsoft Excel 2007 through 2019 contains over 1,000,000 rows and more than 16,000 columns, you may want to reduce the workspace size to prevent your users from unintentionally entering data into wrong cells. For this, you can simply remove empty cells from their view as explained in How to hide unused (blank) rows and columns. That's how you delete blank in Excel. I thank you for reading and hope to see you on our blog next week! One Response to "How to remove blank cells in Excel"
Hi there thanks for the guide, how would you apply this to multiple columns? If this is not possible, is there a simple way to combine columns where this approach has been used multiple times. Many thanks.